Welcome to Cathedral High School! Thank you for visiting our website which serves to celebrate, inform, and reconnect our community as we enter our ninth decade. 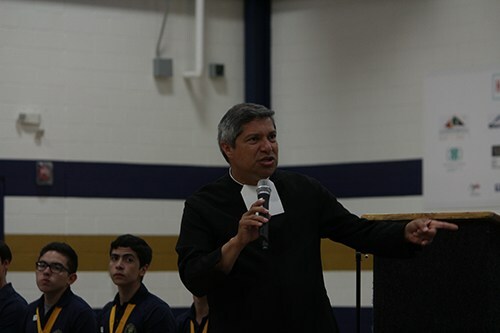 It is our sincerest hope that the Catholic Lasallian values upon which this school was founded in 1925 remain vibrant and relevant in the 21st century. In today's day and age it is more important than ever to be a good man of character, faith, and discipline as the amount of distractions and paths that can lead one astray seem to only grow in number. In a few years, the young man you look after and are considering Cathedral for will venture out on his own into a world that continues to change and evolve faster than previous generations. You and your son's decision regarding his high school education is one of the few chances you have left to choose the community your son is molded by before he becomes an adult; we hope you see the value of a Lasallian education at Cathedral High School and its role to serve as a place that instills within your son the values needed to be a man of excellence in all facets of life, most importantly as a human being. As a graduate of the Cathedral High School Class of 1980, I know full well the range of feelings that can come when deciding on Cathedral as a high school. From the sheer excitement of joining the brotherhood that is "La Cate" to the thoughts if one will find a niche at the school. As a young student whose middle school was a block away from Cathedral I grew up watching scores of Cathedral students walking to and from Cathedral each day. Every student walked with a sense of purpose and as a young man who was directionless, the confidence of knowing one's purpose was an attribute I longed for myself and saw as a dream I could realize at Cathedral. Regardless of your reason for attending Cathedral, rest assured, that Cathedral will provide you with a safe, warm, supportive, and nurturing environment that will push you to become the best version of yourself and never cease to believe in the goodness within you nor in your ability to excel. It's a great day to be an Irishman and we hope you come to experience that firsthand.